A couple of weeks ago, I looked at the dynamic range effects of Sony’s 12-bit shutter modes. Then someone asked about the visual effects of Nikon’s 12-bit raw mode. I did a visual test. For some, that’s enough. If you’re one of those, move along; nothing to see here. Still around? I’m a numbers guy, too. Actually, I’m both, but the rest of this post is about numbers. 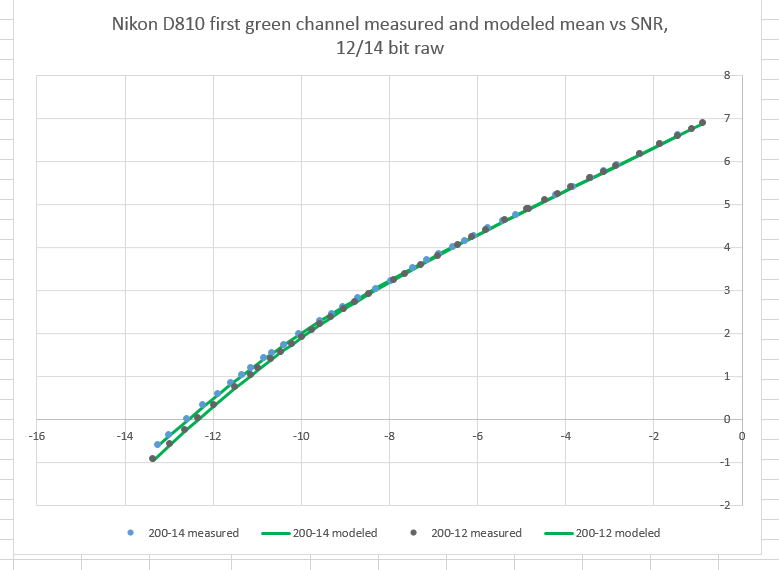 I did a photon transfer curve for the Nikon D810 in both 14-bit losslessly compressed raw mode and 12-bit losslessly compressed raw mode at ISOs of 64, 100, 200, and 400. I figured that by ISO 400, there’d be enough read noise dither that it wouldn’t make any difference whether the precision was 12 or 14 bits, but I wanted to have that data just to prove that to myself — and you all. The horizontal axis is the mean value in stops below full scale. The vertical axis is the standard deviation of the noise in stops below full scale. 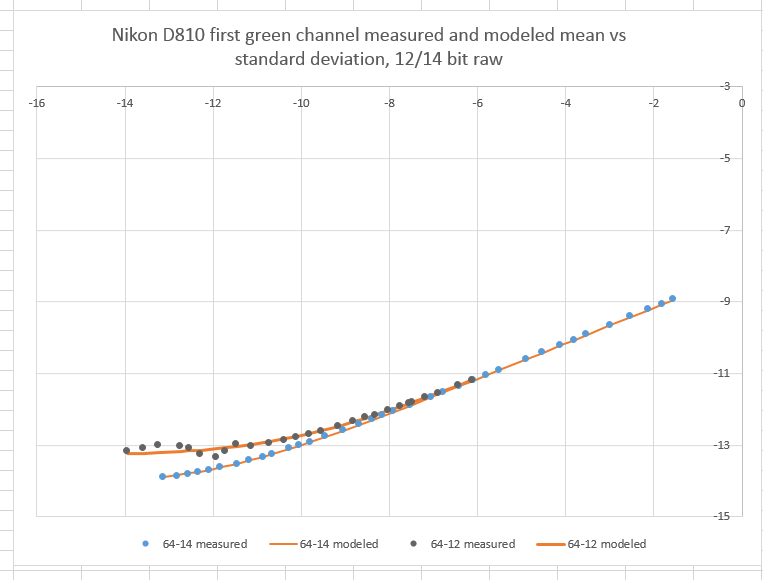 I fit camera models to both sets of data. The solid lines are the modeled data, and the dots are the actual measured data points, each computed from 200×800 pixel samples of pairs of images. 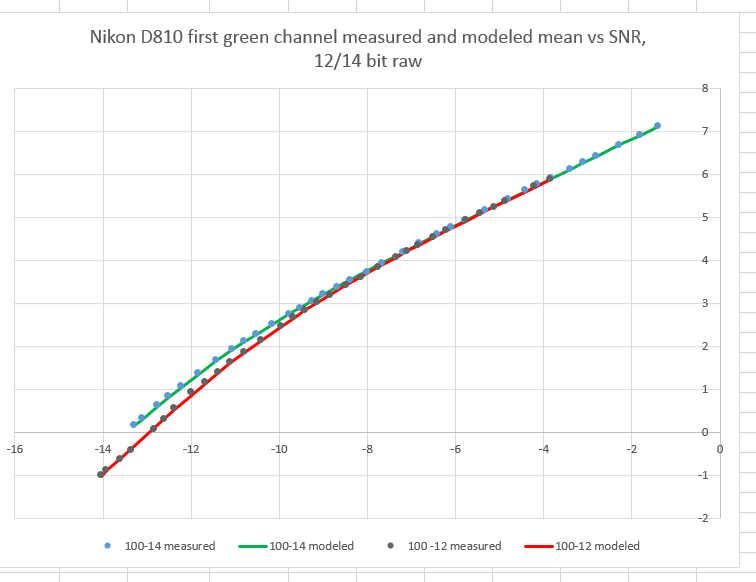 Only the first green channel (RGGB) is plotted. Note the “ringing” in the 12 bit data. We’ve seen that effect before with the Sony alpha cameras. It occurs when there is not enough read noise to properly dither the analog to digital converter (ADC), or in this case the post ADC 14 to 12 bit quantizer in the camera. There’s not much difference between the 14 and the 12 bit case until the signal level drops to about 9 stops below full scale. For the rest of this post, I’ll plot the signal to noise ratio instead of the standard deviation. It’s just another way of looking at the same thing, except now higher is better. You can see that my assumption about the precision not making any difference at ISO 400 was right. Pretty close down to ten stops below full scale. No ringing to speak of, so there’s enough noise to provide sufficient dither. There are measurable differences, but I’ll bet you’d never see them in an actual photograph. ISO 200 and up, 12 bits is fine. ISO 100, 12 bits is probably OK for almost everything. So, if 12 to 14 bit is almost always OK (don’t you hate it when people generalise your conclusion?) why was there always a big thing made of the mythical 16 bit on the MFD backs? 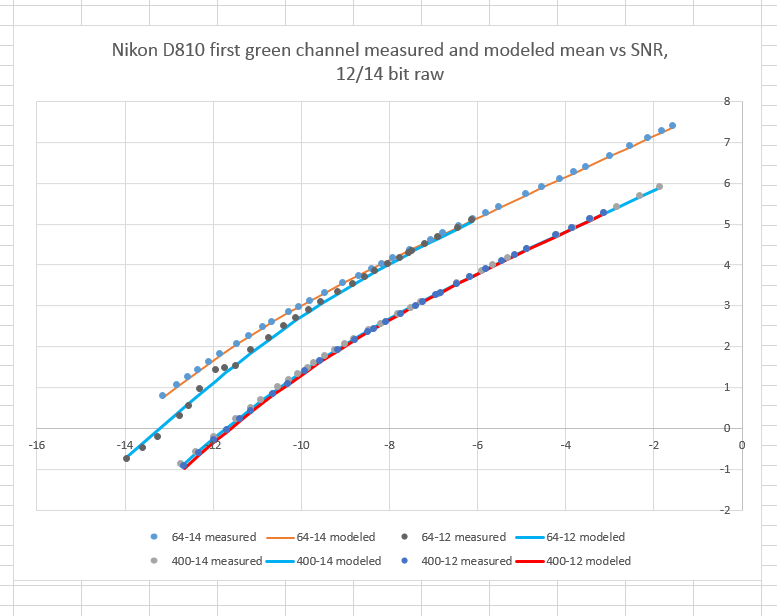 Is it because they are/were iso – less so you are actually shooting at the Nikon 810 equivalent at iso64? Chris, any MF CCD back is gong to be noisier than the D810 at base ISO. That means that 14 bits are probably not needed, let alone 16. I think the 16-bit ADC in the Hasselblad (the Phase cameras are reported to not actually have 16-bit ADCs) are the result of a Product Management edict. If I were an engineer presented with such a demand, I would design the ADC, but I wouldn’t worry if the last few bits were noise, since I’d be getting that much noise from the sensor. If I were really feeling like being maliciously obedient, I’d design a 13-bit ADC with a digital noise generator for the last three bits of the 16. Appreciated, I’m all for myth busting. I hesitated on the 810 recently which had a UK £300 trade in bonus that just ended. I was rewarded by a £400 bonus now available, the balance may have tipped. BTW love the “maliciously obedient” . Thanks, Chris. Note that the Phase, Hassy, Pentax, Leaf CMOS backs based on the new Sony chip, which has greater DR than and MF CCD back all use 14-bit ADCs. They don’t have much choice, since Sony quite properly put the ADCs on the sensor chip. For the noise ratio comparisons, could you explain why the 12bit samples do not go as high up the scale as the 14bit ones do. Is it because there is less highlight detail captured in the 12bit RAW file? Or some other reason, or maybe they’re just overlapped, so I can’t see them. That was just an accident of the capture exposures. In the highlights, it makes no difference what the precision is, so I wasn’t careful about that.